Food Fights is a great book that talks about the food issues most of use have at our dinner tables each and every day. It is about which battles are worth fighting over and which are not. It also has some great advice on what to do with certain behaviors like thowing food. There is even a section about the 5 second rule! As a parent, this is must read. Sounds like something you’d be interested in? Well, I have a copy that I will be giving away to one of my lucky readers! What do you have to do? 1. Leave a comment on this post. I want to know why you would want this book. 2. Twitter about this contest. Please leave me your username so I can verify. Good luck! This contest will end November 16, 2008 at 11:59 PM CST and is for US residents only. 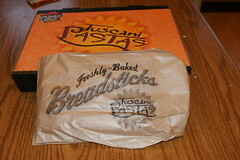 Pizza Hut’s Tuscani Pasta – Premium Bacon Mac ‘n Cheese Giveaway! I love Pizza Hut. When I heard they were coming out with the Premium Bacon Mac ‘n Cheese Tuscani Pasta, I knew we had to try it. This did not disappoint. The rotini pasta is covered with an awesome chedder cheese sauce. That is then topped with more cheese and bacon. 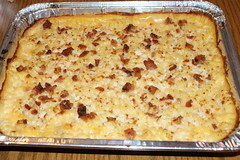 An order of the Premium Bacon Mac ‘n Cheese is about 3 pounds and should feed a family of four. It also comes with 5 breadsticks. This dinner is quite affordable too — it is only $12.99! Everyone at my house truly like it. I like how cheesy it was, my husband loved the bacon topping, Will (my one year old) could actually feed this to himself, and Madison (my four year old) just thought the whole thing was “super yummy in my tummy”. Interested in trying this at your house? I have been the opportunity to give not one, not two, but 3 certificates to my readers to try the Premium Bacon Mac ‘n Cheese Tuscani Pasta. What do you have to do to win this? 1. Leave a comment on this post. I want to know why you would like to try this or why you like Pizza Hut. Good luck! This contest will end Sept. 17, 2008 at 8:00 PM CST and is for US residents only.